Weapon Stats & Strategy for Hunting Rifle in Fortnite. Read here to find information about the damage(DPS), rarity, and reviews for Hunting Rifle! 86 86 1 68.8 1.9sec. 90 90 1 72 1.8sec. Hunting rifles are best suited for Duos and Squads due to the long reload time so it's good to have someone watching your back. Hunting Rifles are best at mid-long range due to its bullet drop off. It can still be accurate despite not having a scope, keeping in mind the effective range of the weapon. 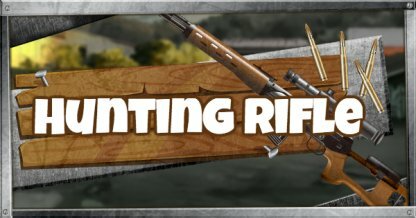 Aiming tends to be a challenge especially if you are not used to the hunting rifle. Reload takes place after every shot and you will need to have good cover when using it. It is possible to one-shot-kill enemy players especially via headshots. Hunting Rifle's bullet drop makes aiming challenging. It also fires bullets loudly which will alert enemies. The high damage makes it ideal as first weapon in engagements when enemies have not yet managed to get too close. Hunting rifles are not ideal for close-range fights so always have a back-up weapon to use. With almost 2 seconds reload time, having cover to put in between yourself and enemy players is essential. Right-click to narrow down sights. This will help improve your chances of hitting your target. It is also recommended that you fire at enemies while they are reloading.